One of Southern Belle’s newest Tybee vacation homes is a 2400 sq foot pristine home located steps from Tybee’s beach. Featuring a six bedroom home with 5 full bathrooms. 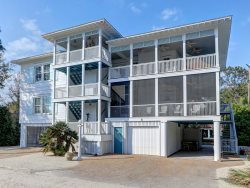 This Tybee vacation home will comfortably sleep 18. It features several amenities that will benefit a large family or group. It is also in walking distance of the pier, dining and shopping. With garage space for two cars and off street parking for a couple of more, you won’t have to compete for on street parking with day visitors to the island. An elevator can take you to each floor in the beautifully furnished home. You can step out onto the large brick covered patio and enjoy privacy as you grill out and or enjoy a dip in the hot tub. There is also an outdoor shower to rinse the sand off from the beach before getting in the hot tub or entering the house. Inside the Tybee vacation home, You will find 6 bedrooms. The first floor has a unique nautical themed bedroom with a queen bed overlooking the courtyard with a full bath. The second floor you will find a spacious Master Suite. The Master is complete with a King size bed, a sitting area where you can get away from the group for a while and relax and it also consists of a beautiful day bed with trundle if small children need to be close by. It also boasts a large master bath with dual vanities with a makeup area, private water closet, a jetted tub to soak away and relax in and a separate walk in shower. It also consists of a private balcony with a peak-a-boo view of the ocean. A second bedroom on the second floor has a queen bed and private on-suite. The third bedroom on the second floor is an amazing bunk room! It has a queen over queen bunk with a trundle if needed. Then a smaller bedroom off this room is a child’s dream. Bunks and a trundle for three. The third bedroom also has it’s own on-suite and private balcony with four comfy chairs for unwinding in after a long day at the beach. The second floor also boasts a laundry room. The Third Floor is the Main living area. The Open Concept Living room has a beautiful shell encrusted fireplace and a large picture window that gives a wonderful view of the beach and the sunrise each morning. A large comfy couch and two sleeper chairs make for a wonderful gathering room. The kitchen is a dream. Open and airy complete with stainless appliances and granite counter tops. There is a small breakfast table that seats 4 and a larger dining table that seats up to 10. There is counter seating for 6. The living room is completed by a wet bar and Satellite TV. There is a balcony of the family room with a view of the beach and a couple of rocking chairs to relax in. The third floor also boasts another bedroom with a queen bed, a balcony with 4 comfy chairs the best view in the house and a full bath. It's large enough to have a dedicated laundry room and gourmet kitchen that any chef would be proud to own. Granite countertops, a huge counter-depth fridge, and a wall oven are just a few of the features that set this kitchen apart from other Tybee vacation homes. The open concept third story also a dining room with seating for 10, a bar with four stools, a small table that's perfect for enjoying a cup of coffee with a newspaper in the morning, and a large living room with a fireplace and seating for eight. All of our vacation rentals Tybee place you just minutes away from the Savannah Historic District, and we recommend spending at least one day checking out the historic squares and visiting some of Savannah's landmarks. Did you know that General Sherman spared Savannah during the Civil War? Because of the city's peaceful surrender, you can explore many of Savannah's original buildings more than two centuries after their construction! Vacation rentals Tybee are within walking distance of the Tybee Lighthouse, which was constructed in 1732, and Fort Pulaski, which Robert E. Lee helped complete back in the first half of the 19th century. Don't forget to check out the Tybee Marine Science Center or the uninhabited Little Tybee Island. It doesn't matter what time of year you come visit Tybee Island — you'll always find a new and exciting experience. Every Tuesday, you can visit the Tybee Light Supper Club to sample some of the finest Southern comfort food and home cooking in all of Georgia. Live concerts covering a wide variety of genres happen on a weekly basis, and not a month goes by without a film or dance happening right on the beach. Because Savannah is located just a few minutes away, you can hop in your car and find something brand new to do each and every single day even if you've lived here for 20 years! Whether it's live theater, stand up comedy, or even a rodeo at the Savannah Civic Center, there's something for everybody. Some events draw folks from all over the world. The Savannah St. Patrick's Day Parade is a wonder to behold! The city dyes all of the public fountains green for the occasion, and tens of thousands of people flock to Savannah for the festivities. In March and April, the Savannah Music Festival showcases hundreds of artists ranging from Savannah natives to singers and songwriters from across the globe. Whether you're looking for a quaint and comforting retreat or an exciting and event-filled excursion, Tybee Island has it all, and Southern Belle has helped thousands of families experience the best that Georgia has to offer with our vacation rentals Tybee. This was by far the best place to vacation! The only team member I had the honor of communicating with, both via email and telephone, was a Ms Jennifer, and I dont believe I ever caught her last name. Either way, she was absolutely fantastic about all my questions and working with me and my bank's strict rules to ensure we had our rental inquiry run smoothly. It may seem a little profane, but my brothers and only have one phrase to describe the property itself and the home: "It's the f***ing Castle In the Sands, and this week, we are its Kings!" Thank you so much for everything! The team was friendly and met our needs. The property, although not on the beach, is a great place to stay for a family vacation. It is open and allows large groups to gather together. It is walking distance to so many restaurants and shops. The booking process was very easy. Good, clear, and regular communication from team gave us information we needed. This is a beautiful property with close proximity to the beach and other amenities. The Southern Belle team was friendly and always had an answer/solution to my inquires. The most impressive aspect of my communications with them was their accessibility - always just a phone call away, even on Sunday evening!! great - the property, the location, and the Southern Belle Staff made our trip wonderful!! You guys rock! It was close to the beach, and the hot tub was nice. We appreciated having beach supplies handy. The artwork and craftsmanship in the home were impressive.